What moral right has the U.N. High Commissioner for Human Rights Zeid Ra’ad Al Hussein to interfere in the country’s internal affairs by suggesting a hybrid special court led by international judges to be incorporated into the proposed new Constitution, asked UPFA MP Niroshan Premarathna. The MP addressing a media briefing in Colombo yesterday said the Human Rights Chief has expressed this proposal presenting an oral update on Sri Lanka to the ongoing 32nd sessions of the UN Human Rights Council (UNHRC) in Geneva last month. “We totally oppose it. We will not allow to set up courts to fulfill the needs of Western nations. Al Hussein has come here to take our war heroes to the guillotine, but we won’t allow that to happen,” he said. Al Hussein has also said that the Sri Lankan Parliament adopted a resolution establishing a constitutional assembly to create a new constitution to go for a referendum in 2017. Premarathna questioned as to how the Human Rights Chief could call for a referendum on Constitutional reforms process where even the government has not announced any such move to hold a such a referendum. The government is engaged in imprisoning patriotic forces. 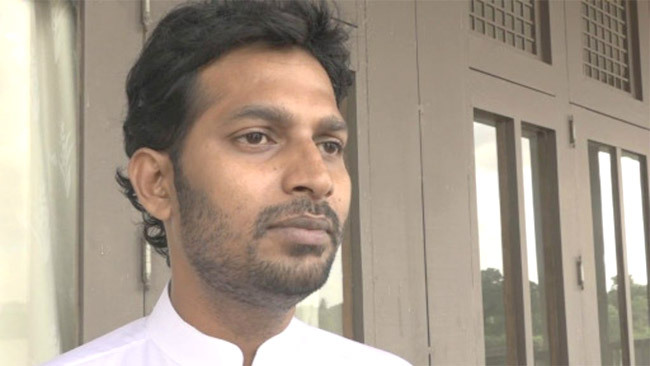 MP Udaya Gammanpila and Media spokesperson of the National Freedom Front, Mohammed Muzammil have been remanded because they oppose bringing in a federal constitution. The government and a section of the Opposition have already given their consent to a federal Constitution and only the Joint Opposition has opposed this suggestion, he said. Earlier, the JVP was the first to oppose the government when it was going on the wrong path. But, the situation has changed and the JVP is today engaged in protecting and promoting the FCID. It is shameful, Premarathna said. Today, Buddhist monks are jailed and there is a witch hunt against the war heroes under the guise of the Commission of Inquiry into Disappearances. The 6.2 million voters, artists and civil society members who voted for the government in 2016 are now ready to bring it down, he said. The MP said all members of the Joint Opposition have agreed on the new political force led by former President Mahinda Rajapaksa with an operational role for former Minister Basil Rajapaksa. “The government is scared of Basil Rajapaksa because he is a good manager. We made certain mistakes last time, but now we have rectified all the mistakes and come on the correct path. We will face local government elections as a separate group and all further elections will be contested under the same force. We already have a large number of provincial politicians supporting our cause,” he added. Remanding of Gammanpila & Mussamil cannot be named as witch hunting. There are so many fraud allegations against both of them. Apart from that they are not patriots. They and some Buddhist monks are racists. Zeid Ra’ad Al Hussein not even knows what is the spirit of a democratic society. he lacks this knowledge completely, because his origin is not even from a democratic state/government! But he is praying human rights to srilanka, what a shame, what a joke. If a culprit call other culprits "culprits", then the fish starts stinking from the head first! UK & US invaded Iraq, on a false pretext to gain oil investments and also to help Israel by destabilising the Middle-East, without Iraq ever posing any real threat to them. And yet very recently UK's (out going) PM Cameron stood firm against any action against British troops for any atrocity commited in the Iraqi war. He also warned lawyers that measures will be taken against them if they try to bring any action against soldiers who were engaged in the Iraqi war. Compare that to Sri Lanka govt, who are hell bent on kneeling before an idiot report by a man who has no right to interfere in the affairs of SL, by trying to set up a special court to bring to trial the brave SL army personnel who fought against a brutal terrorist group to save their own country and its citizens. They did not invade another country. They were defending their own which is a fundamental right every country has. Can not understand the likes of Ranil/CBK/ Mongorilla who seem to be hell bent on punishing their own troops just to please a foreigner in the pay of the supporters of that terrorist group which caused havoc for 30 years in SL. Are they mad or what ? What are SL lawyers doing about this situation ? BASL anyone ?? ?